I've had the great pleasure of listening to this album for more than a month now, after I bought it at Gemma's release gig in Berlin in February. Is it the best Gemma Ray release yet? Is it perfect? Is it wonderful from beginning to end? Yes, yes and yes. Her best albums so far, were "Milk For Your Motors"  and "Island Fire" . Both albums were awesome, but they were not perfect. This new one is both awesome and perfect. Gemma's voice sounds better than ever. The production and arrangements are outstanding. It all has this organic feel, "we all float down here" thing to it. The songs just blend together and the flute/horn bits expand the album's universe even further. Gemma's music was never easy to describe. It is unique and wonderful. Words are just not enough. it just won't let me go"
Is this the best album release of 2019? I think so. I can't imagine any other album will beat it. Prove me wrong, but as for now, I think we have an early winner. I'm on my 2nd vinyl copy and both could have used some more love from the manufacturer. The art of pressing quality vinyl records is unfortunately lost somewhere in the past. Maybe I was just unlucky. Bonus info: on the Thomas Truax album "All That Heaven Allows"  is a duet with Gemma : "Save me". You'll have to get that one too. It is pure perfection. Thomas supported Gemma on her Psychogeology tour. 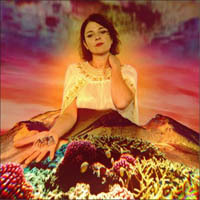 Gemma Ray - Island Fire ♦ Gemma Ray - Down Baby Down ♦ Gemma Ray : "The Exodus Suite"